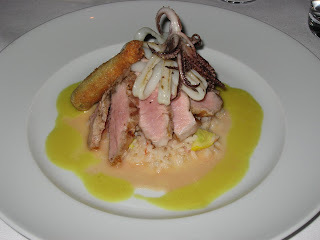 I have blogged about my earlier visit to this excellent restaurant in downtown San Francisco. Ame is owned by Lissa Doumani and her Japanese husband, chef Hiro Sone. Ame means rain in Japanese and the menu here is a creative meld of Californian and Japanese cuisine. Ame also has a very interesting sashimi bar and an extensive offering of sake. 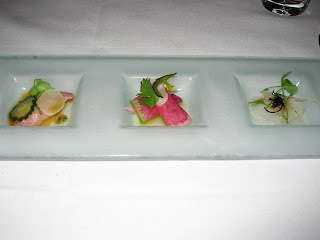 This time I decided to try their Umami celebration tasting menu. Umami is the Japanese word for 'deliciousness', also known as the fifth taste, after the four basic tastes of sweetness, sourness, bitterness and saltiness. Dinner began with a sampling of their excellent sashimi bar: Ceviche with Yuzu Sauce, Halibut Sashimi with Ume Plum and Vinaigrette, Kampachi Carpacciao with Nuka Pickles and Ponzu. I liked the Halibut the best, but they were all very good - to look at and to eat! In fact, here you can't go wrong with the sashimi. Always a good place to start your meal even if you are ordering off the menu. Next came the Corn Bisque with Lobster Tortelloni and Pesto Sauce. Creamy and mildly sweet with an occasional crunch of corn, this soup was a very good too. 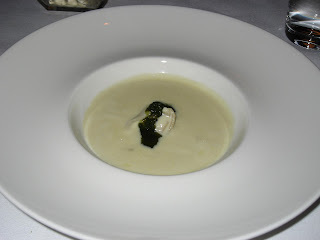 However, I am not a big soup person, so I was already waiting for my next course. 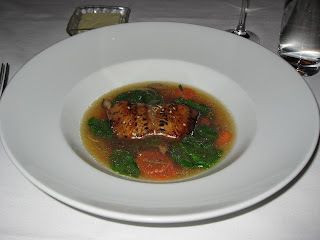 The Broiled Sake Marinated Black Cod in Shiso Broth was another winner! Flaky, very flavorful and every morsel a delight. I slowly savored this dish happy I had decided to eat here tonight. Actually, I had meant to try The Fifth Floor (in the nearby Palomar Hotel), but that restaurant is not open on Sundays. Finally came the Grilled Berkshire Pork on Carolina Golden Rice and Tomato Ricotto with Vadouvan Sauce (picture adorning the beginning of this post). The dish was topped with a fried calamari and a batter-fried pepper. The pork was extremely tender and delicious, and the combination of textures and flavors was perfect on the palate. 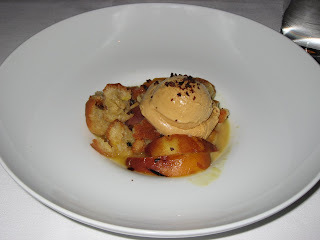 The dessert was pretty good too: Nectarine ' Panzanella' - pieces of crunchy bread - with caramel icecream and dried Shoyu. All of this with glasses of Chikurin 'Karayaka' sake, which was light and floral with subtle notes of cherry. 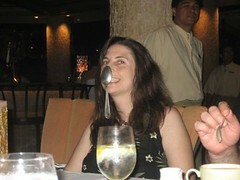 Oh, I love this restaurant! Fellow foodies will probably know this restaurant got a coveted Michelin star last year. Hiro Sone and his wife also own and run Terra (another Michelin starred restaurant in Napa Valley). And yes, I did get to see The Dark Knight. I thought the movie was extraordinarily good - and different from the usual superhero movie. Also, I don't think I have watched a movie in a cinema so crowded. I was at the hall 15 minutes early, and yet had to sit in the fourth row from the screen. 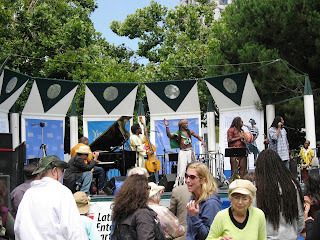 Outside the Metreon, in the gardens there was much merry-making as a band belted out Reggae and families with their kids stopped briefly to enjoy the singing and the warmth of the sun. Oh, and I totally agree on the Dark Night review... Heath Ledger was amazing, I am sure oscar is on its way! No wonder they got a coveted Michelin star! The food sounds and looks delicious. We don't have many Japanese restaurant in Norway, but they have really tasty food. The movie sounds interesting. Haven't seen it, but maybe I should. I hear good things about dark knight ... and my guest blogger did a review for me a while back. @sig: Yeah, combining French or Californian with Asian (esp Japanese) aesthetics and other elements seems to be a trend in American fine dining. @speedcat: Welcome to my blog! well, thank you ... how nice!! Well, that looks really good to me! I like Japanese food (especially sushi) and that looks right up my alley! I'm the opposite for this one. The soup looks really good to me but I'm not sure I'd like the other dishes. not being a meat eater, i wouldn't order most of what you enjoyed. but but but... i loved the way everything was presented, especially against the neutral dinnerware. beautiful. 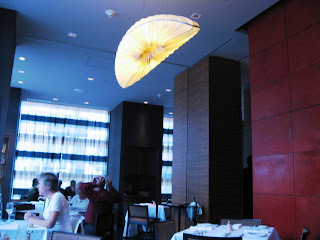 @seraphine: Yes, their presentation is good; comes from the chef's Japanese heritage, I guess. BTW, this being California, they have vegetarian options too. @kate: And tasted great too, especially the Cod. hmm never seen this before :) Do people look at you with curiousity when you take pictures? @priyank: Haha, yes they sometimes do...but I have gotten past the 'stage-fright' now. is this somekind of a seafood. @abhijit: If you are refering to the picture, it is pork and a kind of seafood on top.